Versele-Laga Avi-Chol - for an optimal liver function and a good moult. Versele-Laga - Oropharma Avi-Chol - for an optimal liver function and a good moult. 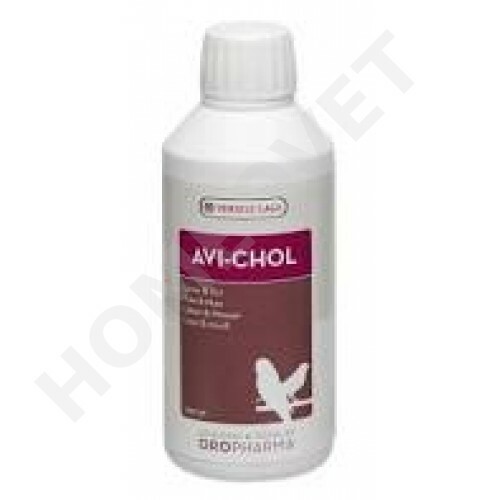 Oropharma Avi-Chol is a dietary supplement for birds for an optimal liver function and a good moult. It is a unique liver tonic based on sulphuric amino acids, biotin, sorbitol and vitamin B12. Avi-Chol ensures optimal growth, perfect plumage development and pigmentation in young birds as well as perfect plumage development and pigmentation in moulting birds. This product also promotes the elimination of waste products from colour pigments and medicines. Optimal liver function is crucial to your bird's health. In young birds, where the body is still in full development, the liver is subject to extra strain due to the greater need for energy, proteins, vitamins, fats and hormones. During the moult the plumage is changed completely. All the necessary elements must be available in the right proportions and supplied adequately. Any deficiency will be visible in the poor quality of the feathers. Your bird's liver is subject to additional strain when colour pigments (coloured canaries) are administered. Administering medicines also puts strain on your bird's liver. Hence the importance of administering a supplement that supports the liver. Avi-Chol contains the active components (methionine, choline, biotin, vitamin B12 and sorbitol) required for optimal liver function resulting in a perfect, glossy plumage and pigmentation. 2 bottle tops (10 ml) per litre of drinking water or per 500 g of eggfood. During the moult and show season: two to three times a week. On administration of colour pigments for plumage : two to three times a week. To support the liver or after administering medication: 5 consecutive days. TIP for administering via eggfood: mix the dose of Avi-Chol first in the water which will be used to moisten the eggfood until you obtain a homogenous mixture. DAC Multivit B12 - 50 multivitamin pills with an extra dose of vitamin B12. DAC Multivit mix for pigeons, poultry, waterfowl, pheasants, birds of prey, parrots etc. Versele Laga Canto-Vit Liquid - for singing and fertility.